This Week in Vexillology, we've moved from controversy to non-troversy in our tour of the Pacific and Oceania- yes, this week, it's the flag of Nauru! Well, let's talk about Nauru. For a start, it's tiny. We're talking about the smallest state in the Pacific and third smallest in the world, behind only the Vatican and Monaco. It's got just over 10,000 people and has a unicameral 19-member Parliament headed by the Speaker, Ludwig Scotty and their President is Baron Waqa (I kept thinking: Baron Harkkonen from Dune? Where is House Waqa from?) Phosphate mining is a big deal there. Originally grabbed by the Germans, Nauru passed into Australian control after World War I and became a League of Nations mandate with the UK and New Zealand as co-trustees. A similar arrangement continued after World War II, but in reality- Australia was running the show. It became self-governing in 1966 and fully independent in 1968. The flag was adopted on January 31st, 1968 for state and civil usage. The narrow gold stripe on the flag represents the equator and the star represents the location of Nauru just below the equator. The separation of the flag into two parts recalls a local saga in which the first inhabitants were brought to Earth by two boulders. The twelve points on the star represent the original twelve tribes of the island and the white of the star represents the phosphate mining which gave the island it's wealth. 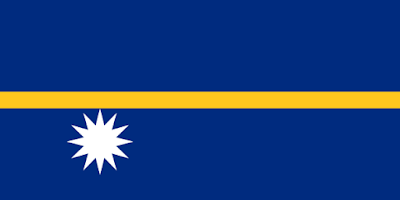 Unlike Tuvalu- there's been little to no controversy about about Nauru's flag. So remember, until next time keep your flags flying- FREAK or otherwise!